Feel like the walking dead before you've caffeinated in the morning? Well, thanks to the Slow Joe Zombie Mug, you can take that feeling to a whole new level with these horrifying and grotesque clay mugs. 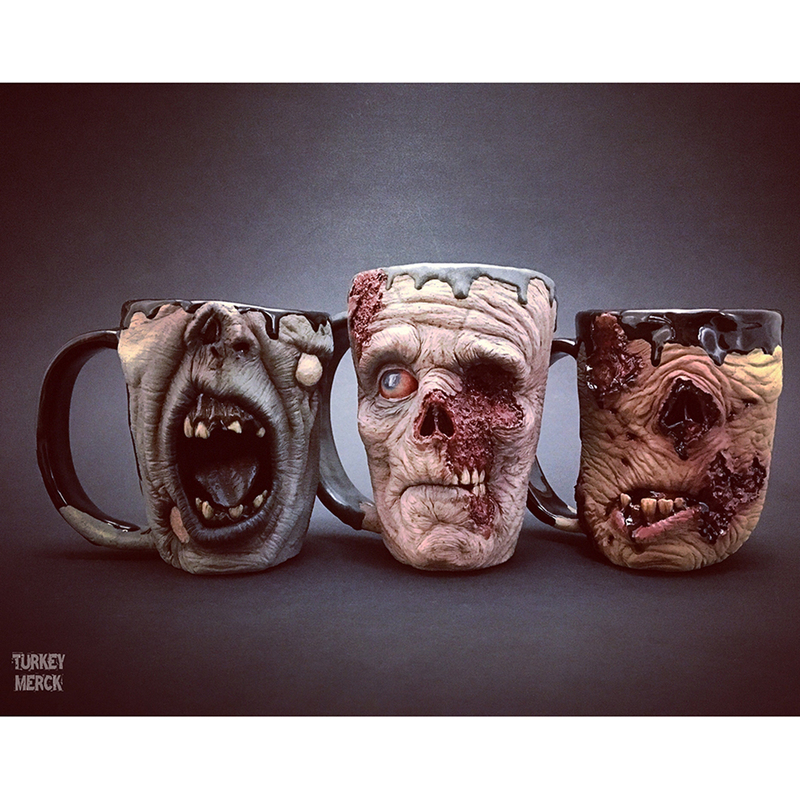 Sculpted with intricate detail, the Slow Joe Zombie Mugs put images of contorted, fetid, and bloody zombie faces as gruesome as any horror movie right into your hands. These mugs are the product of Turkey Merck Pottery, created by Kevin "Turkey" Merck (nicknamed by his first pottery teacher for his skinny legs). The first run of zombie mugs sold out even before Merck was done creating them. In fact, a makeup artist from "The Walking Dead" even bought one. The mugs will be reissued in February, and will mark Turkey Merck's first foray into replicas. The mugs will be made using a mold, but each will still require a good deal of hands-on work from Merck. Why zombies? Because there are so many ways to make them totally horrifying. As Merck told The Examiner, "Creatures and monsters are so much fun because the designs are endless. The zombie characters are probably my favorite overall because there are so many textures and color schemes to play with." Of course, handmade pottery this wonderfully horrendous comes at no small price. Each mug costs $220. You can get a look at the upcoming replicas and explore Merck's creative process, from sketches to clay base to final product, at his Instagram.